Underground filmmaker and genius Jim Van Bebber is one of the most brutal and heinous filmmakers there are out there today. While he made a full length movie (The Manson Family), his short are incredible and in this 1994 short film ”My Sweet Satan” Van Bebber writes, directs, and plays the lead role in one of the most nastiest films that captures ‘Satanic Panic’ era. 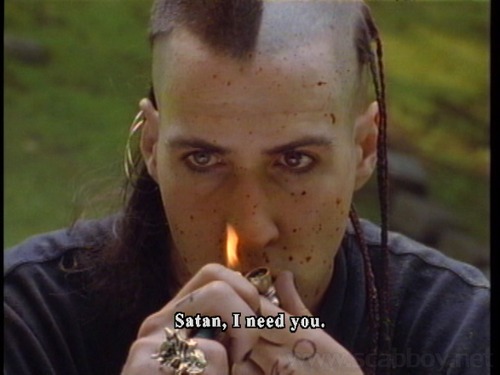 This film is based on the story of the drug addicted, Devil worshiping, murderer teenager named Ricky Kasslin. Ricky Kasslin (Van Bebber), is a drug using, devil worshiping heavy metal fan, with a really weird hair cut. He is known in his area as ‘Ricky the Acid King’, and gives other young adults free drugs. Ricky is almost a kind of Mansonesque kind of person and he has a lot of influence on those in his inner circle. His days are endless hanging out with his friend Jimmy, doing drugs, sacrificing a chicken (don’t worry, its not real) partying and worshiping the devil. However, one of Ricky’s friends steals from him leading to one of the most brutal, nasty and gory on-screen murders. I know this is just a 20 minute film or short film, but you can tell that Van Bebber put a lot of effort into and it the end result is a well crafted heinous piece of underground cinema. Van Bebber is extremely talented and versatile and has starred in most of his films. He has also directed music videos for bands such as Pantera and Superjoint Ritual and Necrophagia’s home video ”Through the Eyes of the Undead”. However, he has an extreme and abrasive film style that is too extreme for Hollywood and that is why he is such an underrated director. But believe me, he blows all the other mainstream horror directors out of the water, and his films are usually shot on a low budget with a lot of creativity and his films have a Grindhouse kind of vibe to them. So, if you want a nice piece of extreme and nasty horror, this is totally for you. Some horror fans that are used to gore are shocked and disgusted by the murder in the finale of this film, as it definitely packs a disturbing punch. Chances are, this title will become one of your top movies once you have seen it, even if it is only 20 minutes long.It is a pretty accessible film too. Just google it and you will be able to see the film in its entirety for free.